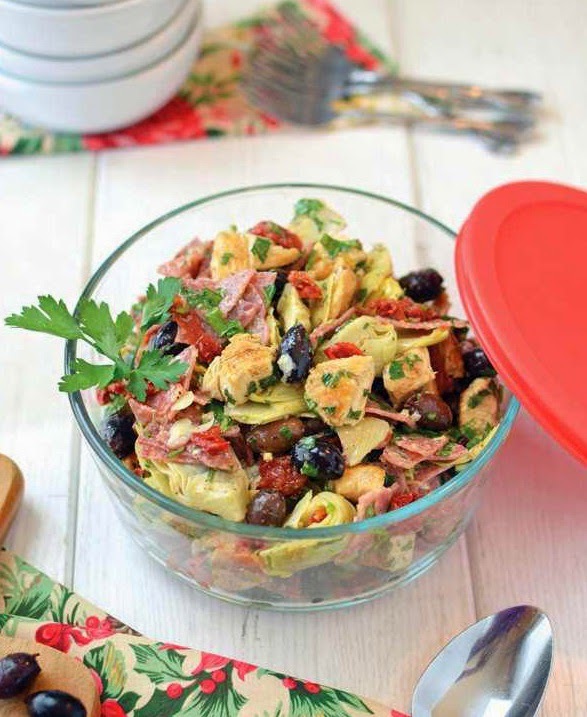 My original antipasto salad recipe appeared in Paleo Indulgences and has been a family favorite for years. While we have enjoyed that particular version many times, I realized recently that it is more of a delicious side dish than a main meal when taken on the road. So I added grilled chicken in the grilled chicken antipasto salad, swapped the black olives for kalamatas, updated the dressing, and increased the measurements to feed a crowd. Now I have a one-bowl meal that travels well, and the whole family can enjoy it! Every once in a while, just to keep things interesting, I add chopped cooked bacon, pickled asparagus, mushrooms, or chopped raw cauliflower. This one’s best made the day before so that it soaks up the dressing and gets all yummified! You and also take ques from citrus red onion slaw to add to this recipe. In a large bowl, combine the salad ingredients. Set aside. In a jar with a tight-fitting lid, combine the dressing ingredients. Shake to mix well. Cover the salad, and refrigerate it until needed. Stir the salad again before serving.